Memorial which hangs in the foyer of the School was commissioned by the League. encourages their professional development by awarding scholarships. members in touch through the League Magazine, seminars and yearly meetings. 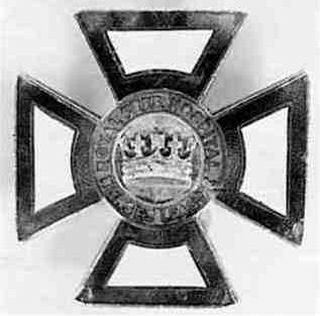 In 1960, to mark its diamond jubilee, the League gave the badge to the Board of Governors, the coronet being replaced by the lion presented by Queen Victoria at the granting of the Charter. 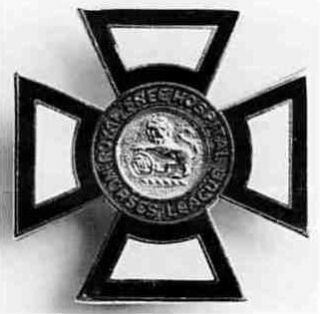 This badge was worn by League members from 1960 to 1974. 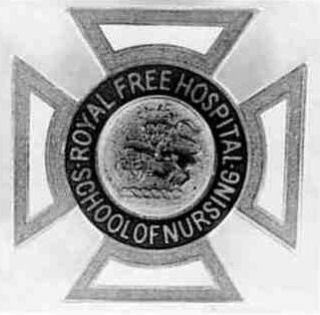 In 1975 the words Royal Free Nurses' League were replaced by Royal Free School of Nursing and the badge was presented to all trainees of the School. We have had several requests for the badge from new members and from some who have lost theirs. However they are no longer produced. Royal Free Hospital Nurses League. If anyone is requiring a badge please use the email form on this website to let us know and we will keep your name on file in case any become available.